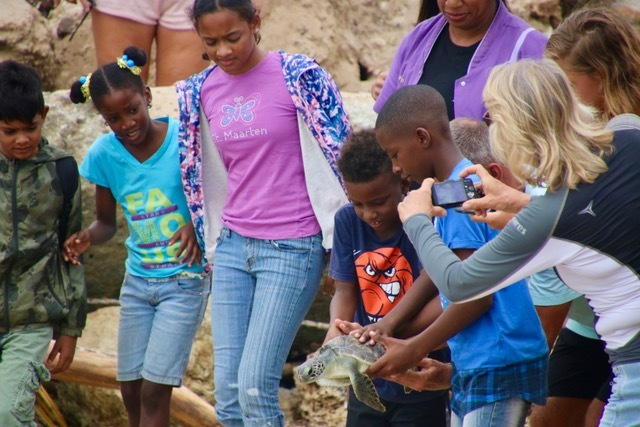 WILLEMSTAD - Recently a young green sea turtle (named Kaycee on the spot) was released in nature after it was found a few months ago in the waters around Klein (little) Curaçao. This took place at Wakawa with the presence of schoolchildren led by Clarette Schoop, Carmabi Director Paul Stokkermans, Volunteers of the Sea Turtle Conservation Curaçao (STCC), CARMABI board member, volunteer STCC and veterinary surgeon doctors, Odette Doest and the Member of Parliament Ms. Giselle Mc Williams. 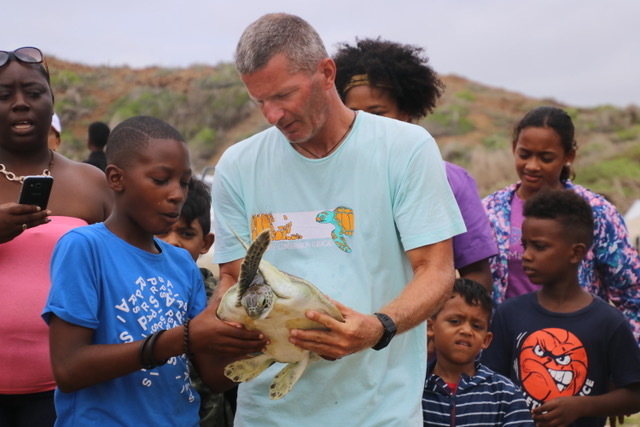 This green sea turtle was found weakened shortly after Trinidad's oil spill and in the waters around Klein Curacao along with a flamingo in the same condition. The STCC volunteers were on Klein Curaçao to monitor green turtle nests then transported the two animals to Veterinary Practice Doest. The flamingo, called Gina, completely recovered and was already returned to nature at the end of June by the volunteers of Caribbean Animal and Education Foundation (FDOC) and veterinarian Odette Doest.